Putt's roll true...works with any ball. Just like automobile tires appear to be perfectly round--yet they still need to be spin balanced before being driven at high speeds--the same holds true for golf balls. The inherent lopsidedness of every ball works against you off the tee and on the green. Ever make a beautiful 10-foot putt on a level green only to notice the ball curve away from the hole at the last second? If you thought there must be something wrong with yor equipment-you were more correct than you know. Believe it or not, a perfectly round golf ball has never been manufacturered! The Check-Go automatically realigns the balls heaviest areas along its equator, so that the ball no longer has a tendency to wobble, but rather roll more accurately on the green and drive further off the tee with few hooks and slices. Conforms to USGA Rules and is legal for tournament play! 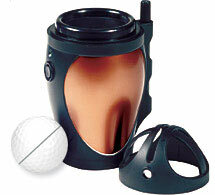 Place a new golf ball in the Golf Ball Spinner and replace the safety cage (the black piece on the top of the unit). Press the button for several seconds while the Golf Ball Spinner's high speed gyroscopic action realigns the ball's variance in mass along the equator. The ball is spun at a high rate inside a plastic cage and within seconds will balance on its axis (the dimples on the golf ball will not be visible). Now, you mark the top of the axis through the top template by placing a dot on the ball. Then, draw a line around the equator by placing the pen in the hole provided on the protective safety cage. This mark will show the ideal position for striking the ball. While spinning, use the special pen to permanently mark the ball's unique equator. When teeing off or on the green, simply line up the ball's equator with your target and swing as usual. Simply mark each ball's unique sweet spot before you play. You will enjoy more accurate shots, greater distance and lower scores. Upon impact, the ball shoots forward with a velocity of about 50-100 mph. At the same time the loft angle of the clubhead causes the ball to spin at about 2,000-10,000 rpm. The effect of the back spin imparted generates two newtons of lifting power (5 times the power of gravity). This is called the Bernoulli principal. It is the lifting power which determines the flying distance of the ball. The balck spin also improves stopping on the green with iron shots.